Joe Martin with a Sherline 4400 lathe. 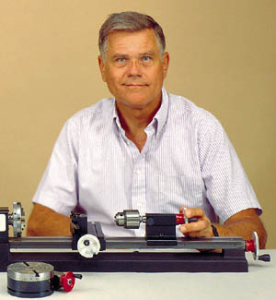 When Joe Martin founded Sherline Products Inc. in the early seventies, his vision was to produce a miniature tool line with every accessory needed to build small, complex machined parts from metal on a kitchen table if need be. These could be the individual machined parts needed to build a perfect miniature 4-cycle V8 or a beautiful clock. All you have to do is examine the beautiful projects created by Sherline machinists to realize Joe accomplished his goal. This was no small undertaking because there weren’t any machine tool accessories available that would fit a Sherline. Each year Joe would add several accessories to the line to make his tools more user friendly, and now after 30 years of doing that Sherline undoubtedly manufactures the most complete line of tabletop machine tools today. As the product line grew the demand for new accessories dropped and Joe took on a new challenge. He wrote a book Tabletop Machining and founded The Joe Martin Foundation for Exceptional Craftsmanship, which is supported by his company as a way of giving back to the customers who supported his company all these years. Each year a very special award is given to Joe’s “Craftsman of the Year” pick. Along with this an Internet Craftsmanship Museum was created to make the general public aware of the talent of these outstanding craftsmen along with recognizing their marvelous work. Sherline isn’t just another company selling imported goods for a quick buck. We are in it for the long haul. Sherline has been producing what we sell in our own facility for over 30 years, and you’re welcome to stop by for a visit. By purchasing a Sherline product you are not just buying a tool, you’ll be joining a team that works together for your benefit. A large selection of high quality accessories is one of the things that adds value to a tool line. All manufacturers know exactly what their tools are worth and price them accordingly, trying to appeal to a particular segment of the market. Some customers are strictly price oriented and some are strictly quality oriented, but most are somewhere in between. They want the best quality for the price. They don’t want to overpay, but they also don’t want to find themselves handicapped by poor tools when it comes time to make a challenging part. Newcomers sometimes don’t realize that the less expensive machine tools often require a lot of shimming, scraping and adjustment before they are capable of making accurate parts. A good machinist knows how to do this and can turn these “kit” machines into good tools, but most beginners need a tool that is accurate right out of the box. Unfortunately, the proliferation of shoddy imported tools has prevented many beginners from enjoying the fun of miniature machining. They have gotten tools that kept them from making good parts and wrongly assumed it was because they just weren’t good enough. That person doesn’t usually buy a better machine, he finds another hobby. Miniature machine tools have been our specialty for the past 30 years. Unlike some large foreign factories, we weren’t making sewer lids yesterday and won’t be making cast iron kitchenware tomorrow. We know our machine tools, what it takes to make them well and what the people who use them do with them. Though not the cheapest tools you can buy, we do feel that Sherline tools offer the best value—the most “bang for the buck”—of any tool in the miniature machine tool market. We have 30 years of satisfied customers who agree that we have achieved and continue to achieve that goal. We hope you will consider becoming one of them. Versatility—Sherline tools are designed to provide maximum utility in a small space. The tools themselves are capable of any machine shop operation, particularly when combined with the very large line of available special purpose accessories. The only limits are size and your imagination. Portability—A major consideration in Sherline tool design is to provide maximum rigidity while still keeping weight to a point where the machines can be easily transported and stored when not in use. This is why many of the parts are made from costly aircraft grade aluminum rather than less expensive cast iron or steel. Power—The 90 volt DC motor we use provides torque in the lower RPM ranges where you really need it. AC/DC motors must run at high RPM to produce their rated power and are noisy. AC motors are large and run at a fixed RPM without extremely expensive controls. A comparable Sherline DC drive system purchased through the industrial market would cost as much as a complete Sherline 4000 lathe, over $600! Controlling Quality—Making our own tools rather than outsourcing them to someone half way around the world means we have total control of both quality and inventory. A problem that crops up can be fixed immediately, not after a boatload of tools arrives. A shortage of one particular part can be remedied in a few hours or days, not months. This means fast service for you, whether you need a tool, an accessory or a small replacement part. Service and Support—Our written instructions are the most informative and complete in the business, bar none. Our web site is also the largest in the field and can probably answer any question you might have without having to call anyone. If you do need to call us, you will talk to a real person, not a voice mail merry-go-round. Any questions or problems you have WILL be solved quickly and professionally. State-of-the-Art Engineering—From digital readouts (DRO) to Computer Numeric Control (CNC), Sherline is always on the leading edge in machine tool design for the hobbyist. In most cases existing tools can be upgraded as changes occur or improvements are added. DRO and CNC can be added to any existing Sherline machine, or you can order a new machine with digital readouts installed or CNC-ready with stepper motor mounts in place ready for the application of CNC controls. You can even purchase a complete CNC system that includes not only the machine but also the motors, drivers and a new computer with software already installed so you can pull it out of the box and get right to work in CNC. Modular Design—Because all Sherline components are designed as a system, they can be combined to work in many configurations. New accessories are always designed to work with existing machines, so your tool will never become obsolete. Low Cost, Long Term Operation—Many Sherline tools are used not just by hobbyists a few hours a week. Many fulfill production needs for small parts in industrial applications. The parts that do eventually wear out and need to be replaced are designed to be the least expensive on the machine. High Quality, Graded Materials—One advantage of working with American metal suppliers is that we know when we order a particular grade of aluminum or steel, that is exactly what we get. This allows us to maintain consistent quality, but this is sometimes not the case in developing nations using un-graded materials produced locally. Experience—Sherline has been making quality tools for 33 years. Our key management people have all been with the company for well over 20 years. Our average length of employment is over 7 years. This is a good company to work for and our personnel have a personal investment in seeing that quality is maintained at every level. Large Owner’s Groups on the Web—Sherline owners have joined together on the web to form a discussion group offering advice and assistance to other owners. You can find out how others have solved specific problems or what they think of certain tools, processes or accessories. See www.yahoogroups.com and join the “Sherline” (public) and/or the “SherlineCNC” groups. The Best Tools We’ve ever Made—How often have you bought a product from a favorite manufacturer only to discover the “new” version is now made from cheaper materials and no longer has the quality that you expected? The pressure to lower price by cutting corners is a strong one, but we have not taken that route. In fact, due to the improvements in the past decades in accuracy and repeatability of the large CNC tools we have purchased for our factory, the tools we now make are the best we have ever produced. We continually add features and improve designs too. Of course, we are always on the lookout for ways to keep costs down, but never at the expense of quality. Compare a new Sherline tool to one from 10, 20 or 30 years ago and you will see we have made no changes except to make something better.